Salt stress is one of the major abiotic constraints that inflicts impaired growth and reduces production potential in crop plants. Under salt stress conditions, numerous plant growth processes are affected, i.e., hormonal and nutritional imbalance, ion toxicity, physiological disorders, and susceptibility to insect and pest attack. The growing menace of salinity is predicted to intensify both in its extent and severity, posing a stern challenge for developing a resilient food production system in coming years. Various agro-biotechnological interventions are being employed to improve salt stress tolerance in plants. However, the complexity associated with plant salinity tolerance has only allowed marginal progress for breeders and genetic engineers. Use of soil microbial resources to promote plant growth by alleviating the exposed stress factor has gained much needed attention in recent times. 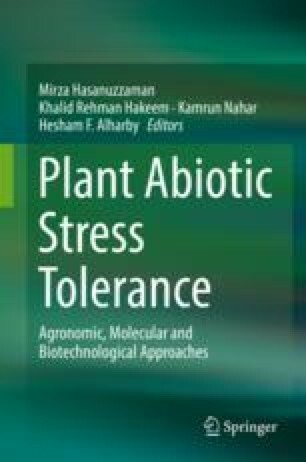 The application of plant growth promoting rhizobacteria (PGPR) and arbuscular mycorrhizal fungi (AMF) based bioinoculant strategy is perceived to enhance plant growth under salt stress. Microbial inoculation evoked plant stress tolerance response and improved plant growth, which is mainly triggered by modulating nutritional and hormonal balance, producing plant growth regulators, solubilizing nutrients, and inducing disease resistance. In this chapter, we describe causes of soil salinization and discuss potential impacts of salinity stress on plants. In addition, we also discussed the action mechanisms of plant growth promotion and/or regulation exhibited by PGPR and AMF, and highlighted their intrinsic traits that can be up scaled to increase their usefulness as a value-added product for stress agriculture.